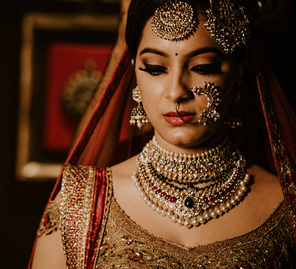 Each one of Mannat’s wedding getups captured a distinctive mood. From looks that spelled ease and comfort to those that were about red carpet glamour, her trousseau covered it all. The Marketing Manager for West Edmonton Mall, the largest shopping mall in North America, a professor who teaches marketing at MacEwan University and a budding blogger and designer – Mannat has multiple facets to her personality and her wedding wardrobe reflected just that! She tells us about how she went about creating a trousseau. The color story for my mehndi was yellow and lots of flowers. So my look resonated with that. I picked a lehenga by Sukriti and Aakriti in yellow with a kurti style blouse. The ensemble featured gota work in silver and gold and was paired with a beautiful scalloped dupatta in white. I wore minimal jewellery. My hair and makeup artists for all my functions were from Glo Bar Studio, Toronto. For the mehndi, they gave me a braid intertwined with fresh blooms. I wanted to wear florals, look relaxed and yet be a bit of a princess at the sangeet. I went with an outfit by Anushree Reddy because her work has all these attributes. I opted for a pistachio lehenga with intricate designs created using sequins. This came with a beige blouse covered in gorgeous zardozi work and a printed dupatta. To accentuate the outfit, I put on simple gold jewellery and added flowers in my hair to keep the look airy and fresh! This was the only function for which I didn’t buy a new outfit. You’re supposed to be quite minimal on this day so I pulled out a favorite red salwar kameez. Since I was going to have haldi all over my face and hands, I skipped makeup and jewellery and went with a natural look! It was a dream to wear a pastel Sabyasachi to my wedding and so began the hunt which ended at Ogaan, Hauz Khas Village. A soothing tone, detailed design, and intricate threadwork – it was literally my dream outfit brought to life. Most of the jewellery I wore at this ceremony was gifted to me by my grandmother and designed by my mom! Since my wedding day look was so pastel and dreamy I wanted the reception styling to be stronger and bolder. So I went all out with the glamor in a custom-made outfit by Nadine Dhody. 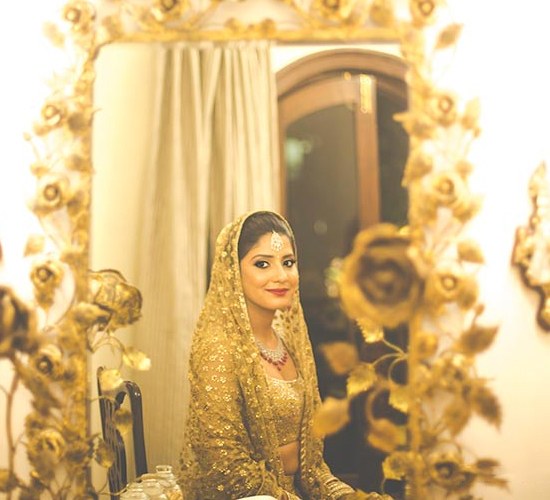 The fiery red lehenga was covered in work that added a whole load of sparkle to it. My hair was styled in waves with just a small section pulled back. I felt like a star ready to walk to the red carpet! It’s hard to plan what’s supposed to be your dream week and there is a lot of pressure to look and feel your best. My only advice would be, if you don't know what you want and only know what you don’t want– it’s okay. This knowledge helps you begin to whittle down your options which is better than having a never-ending list of alternatives. Other than that, weddings are dreamy and go by in a flash. Enjoy every moment and know that marriage is even better! I would recommend Glo Bar Studio from Toronto to everyone! They kept me on schedule and laughing all week long! I didn't have anything in mind for hair and makeup, to be honest. I showed them my outfits and gave them free reign, so all the distinctive looks at the functions are all their creative genius! And of course our Indian designers mentioned in my outfit details - are all so talented and a dream to work with. Lastly, make the most of the wedding planning portals online. I set WeddingSutra.com as my homepage when I was wedding planning! It's so nice to have a website from where you can draw all your wedding inspiration! From clothes to decor to general aesthetic, there is something for everyone here - Brides, bridesmaids, parents, grooms, sisters, wedding guests alike!